Picture this: you're walking down the street on an unseasonably warm and lovely day in New York City. 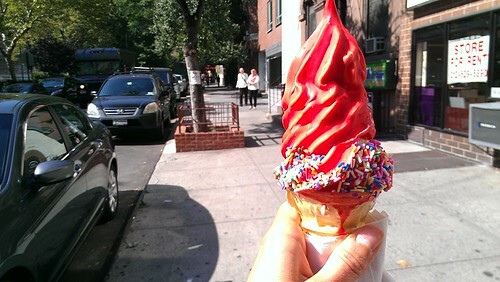 You spy the Mr. Softee truck on the corner, and decide to buy yourself an ice cream cone. Just like that, your whole day changes. What was pleasant before is spectacular now, and you didn't even see it coming. 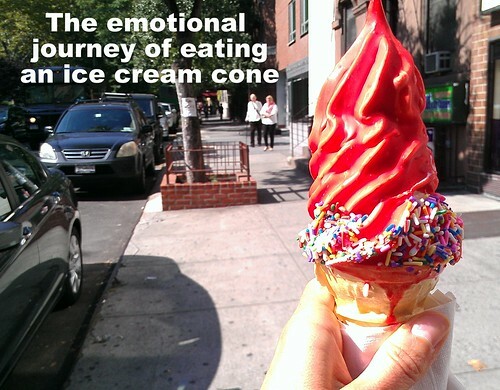 But...are you prepared for the emotional journey of eating an ice cream cone on a beautiful day in New York City? Because truly, what seems like an effortless and breezy experience can really start quite a chain reaction of emotions. I recently documented my thoughts at several stages of the ice cream cone eating process, and have narrowed it down to 12 stages. Why would I do such a thing? To equip you, dear reader, with a road map of what to expect--the joy and the sorrow--that comes with eating an ice cream cone. So that you can know you're not alone. You have walked by the ice cream truck and decided to go for it. This is a beautiful moment. 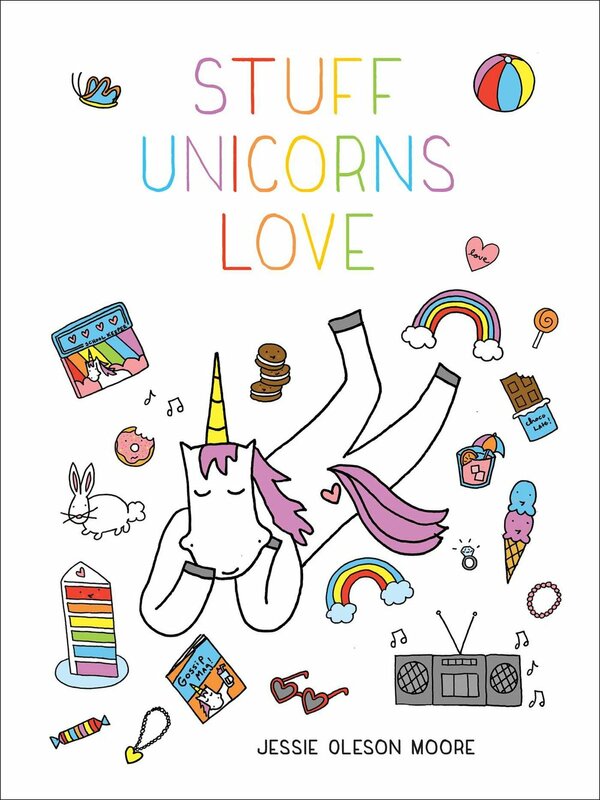 You may see sparkles in your peripheral vision. The world seems magical. Stage two: anticipation. You have ordered. The guy is preparing your cherry dip with sprinkles right now. This is a sweet moment. You've got ice cream coming and it's a beautiful day. Stage three: slight twinge of sadness. 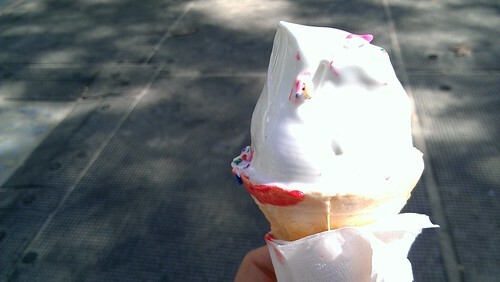 It's the strangest thing, your ice cream was just handed to you, but you felt the weirdest little twinge of sadness. Why? 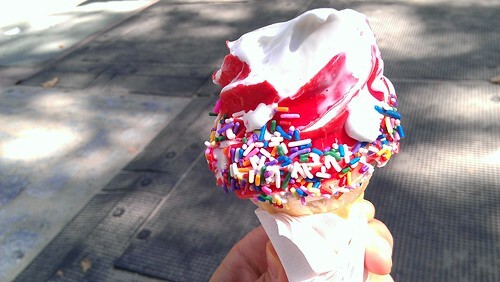 Because even as your ice cream cone is handed to you, you can sense innately that this joy is already fleeting. 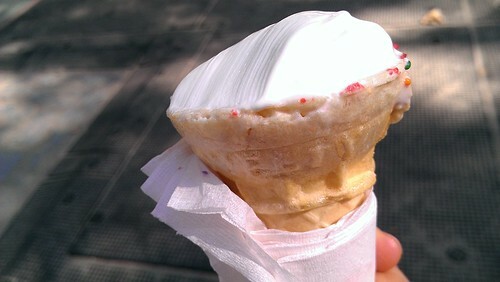 It is warm, so the ice cream is soft. Yet it is mingled with joy, because you are taking your first lick. In terms of eating, you're in a place of "Pleasuretown, population you". You've taken a few licks but your cone still has its perfect shape. It's creamy, it's delicious, but you've still got a long way to go. You're tasting every little lick and bite. This cone is beginning to disappear way too fast. What happened to the perfect cap of ice cream? 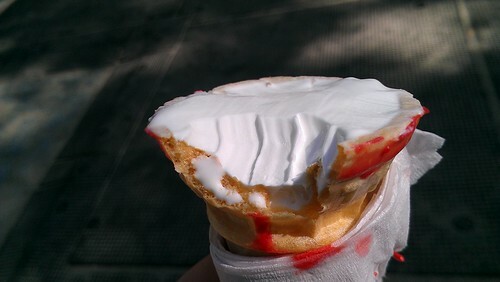 It's half sized now, and things are starting to melt so you're having to lick more rapidly, doing small repairs where the ice cream is oozing near where it meets the cone. Wait. You calm down for a minute. You haven't even reached the cone yet, almost but not quite. You still have ice cream to enjoy. It tastes great. You are loving life on this warm day. You feel calm. 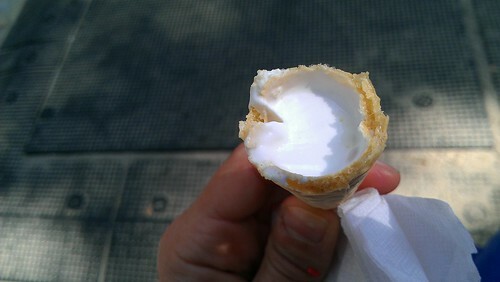 You bite into the cone, and although you've been dreading this moment because it means you're nearing the end of your cone, the pleasing crunch of the cone against the cool, creamy ice cream is actually quite nice. 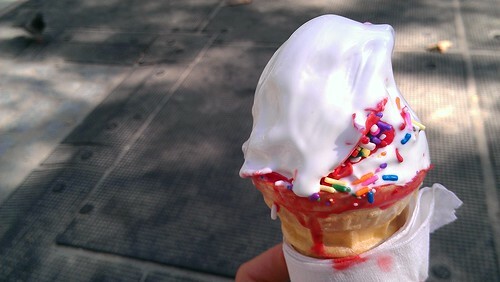 In an effort to avoid the thought of this cone experience ending, you gently nibble the cone as evenly as possible and try to imagine how it would look if a small animal such as a squirrel were holding it. Hilarious! This cone is ending fast. Your heart hurts. It's coming to an end. Stage eleven: crazy desire and irrational thoughts. If some is good, more is better, right? Should you get another cone? Should you go back and tell him you dropped it and see if he'll give you another? Should you grab that cone the little kid next to you has? You may not be proud of thoughts you have during this phase. Stage twelve: acceptance. The cone was good, but now the cone is gone. You wisely choose to take Dr. Seuss's advice: "Don't cry because it's over, smile because it happened." 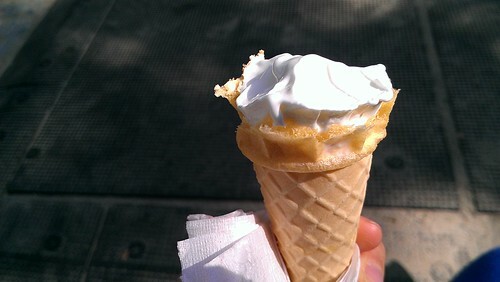 Do you have a specific way of eating an ice cream cone?